Activision CEO Bobby Kotick says Facebook-style social interactivity is a big part of why the Call of Duty games are so popular and credits Treyarch with making it happen. True story: I've never played any of the "new" Call of Duty games. I have no interest in the multiplayer and based on what I've heard from people who do enjoy them, the single-player component is just a six-hour warmup for the real action that takes place online. Some players apparently don't bother with it at all. That's probably okay with Bobby Kotick, though. 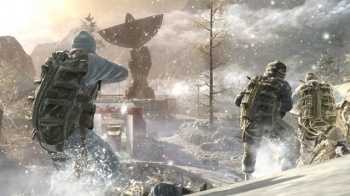 Call of Duty is the world's preeminent FPS franchise and Kotick credits that largely to the game's online component, which he says has become a new medium for social interaction. "If you look at the 500 million people who are on Facebook and the way that people text each other and instant message and use video chat, there is now an evolution of media," he told CNN. "Those are the characteristics and attributes that a generation and audiences feel are very important to their media and entertainment experiences. And we expect that." You can thank Treyarch for that, according to Kotick. Infinity Ward's Modern Warfare games are the flagship of the Call of Duty franchise but their multiplayer components, which have made them so enduringly popular, were "largely developed" by Treyarch, the studio often viewed as IW's slightly-less-competent junior partner. "I don't think Treyarch got their due for how much they contributed in the production and polish to the multiplayer," Kotick said. Not that I'm questioning his sincerity, but it's not really a surprise that Kotick is giving a boost to Treyarch, even if it means sticking it to Infinity Ward just a little bit. Like it or not, the implosion of Infinity Ward means Treyarch is now Activision's FPS Studio Numero Uno. A little pep-talk from the boss, and a gentle reminder to the world at large that there's more to Call of Duty than just Infinity Ward, probably isn't a bad idea.